Where will we find badly needed leadership for climate adaptation? The United States, under President Trump, has withdrawn from the Paris climate accords. That creates a gaping leadership void regarding federal policy support for either mitigating climate change (by reducing greenhouse gas emissions) or adapting communities and businesses to better withstand its impacts. 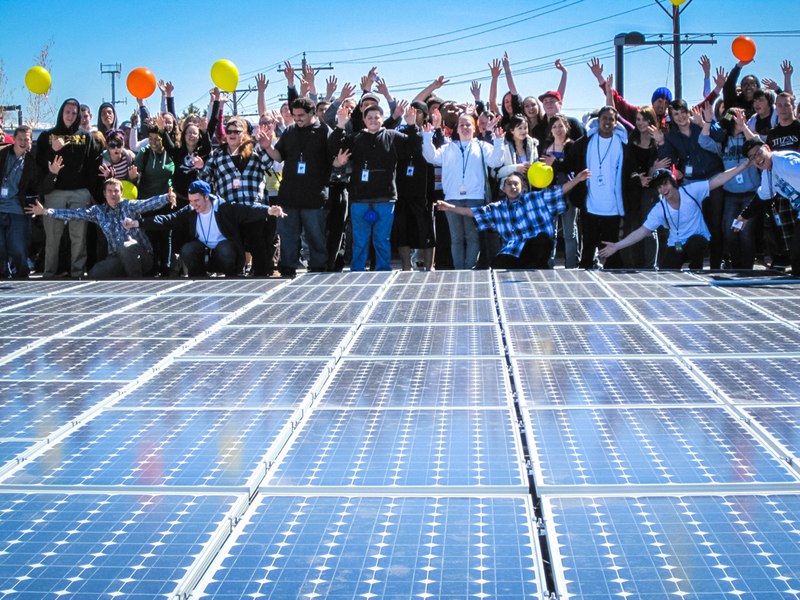 Many cities and some states have claimed the mantle of leadership by pledging continued efforts, and a few foundations have undertaken initiatives. Other long-standing professional associations, including APA, have weighed in on the subject, and even offered professional training, while maintaining their traditional focus. But is all this activity a concerted push in the right direction? Or is it a growing babble of voices without strategic direction? Amid it all, is there an emerging field of practice for climate adaptation professionals, and if so, how well defined is that field? What credentials should it develop or require? These are no small questions because a great deal depends on the credibility of the scientific assessments made of the problem we must confront. In that context, a new report from the Kresge Foundation, Rising to the Challenge, Together, is a welcome addition to the conversation, even as it stresses the urgency of both the conversation and our response to the problem. 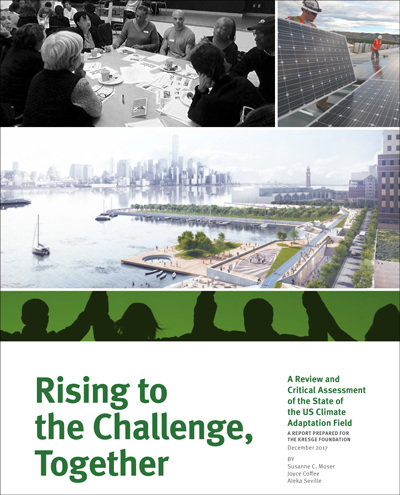 This report, commissioned by The Kresge Foundation, assesses the current state of the climate adaptation field; provides a vision of what a mature, effective field would look like; and recommends steps that should be taken to realize that vision. It is difficult for anyone well grounded in the science to argue with this sense of urgency. An appropriate image might be that of attempting to scale a mountain amid a landslide. That does not mean that I think the situation is hopeless. It does mean that the only solution may be to buckle our safety belts and rapidly grow our tenacity in confronting the perils that lie ahead. Tenacity is very different from panic. Responding to crisis is reactive; tenacity requires vision. The problem, the authors note, is that the adaptation community has not yet defined a “vision for a desirable future.” What brave new world sits at the top of that mountain? 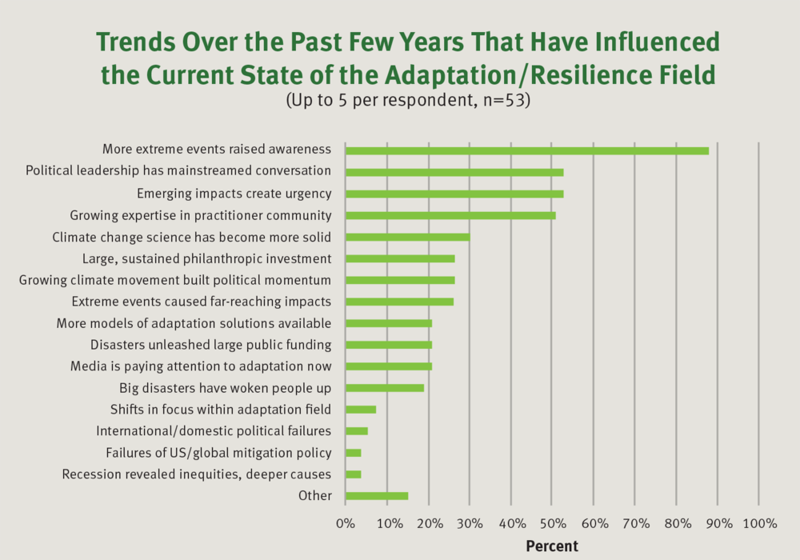 Trends influencing the climate adaptation/resilience field. Figure 11 in Rising to the Challenge, Together. There is an aspect of the emerging climate adaptation field that calls to mind the origins of both the urban planning and public health fields, which most people would describe as having the maturity that this new field seeks to achieve. Both responded to urgent health crises in rapidly growing modern cities in the late 19th and early 20th centuries. Because of uncontrolled industrial pollution and poor sewage management, cities like Chicago, New York, and Baltimore were virtual petri dishes for disease. In time, both professions established positive visions for desired community outcomes, but those visions must now contend with the new threats climate adaptation aims to address. APA national and state conferences over the past two decades have seen dramatic shifts in content, with a greater emphasis on preserving those positive visions by addressing climate change and mitigating natural hazards. The 4Ps of a Field: A field is made up of four basic components — purpose, people, practice, and pillars. Figure 6 from Rising to the Challenge, Together. This framing device may be one of the report’s most important contributions to thinking about the future leadership of the climate adaptation field. I would add that it is particularly important to see climate adaptation, much like its planning and public health forebears, as a field that is less about theory, although theory remains important, than about applied knowledge. Unless adaptation is a matter of practice, the urgency the report discusses makes no sense. One crucial skill planners may be able to contribute is synthesis. Planners may have their own unique set of skills and analytic methods, but they rely overwhelmingly on borrowing technical knowledge from the sciences, engineering, and economics to make sense of the urban organism and to help shape its future. Likewise, climate adaptation practitioners will need to rely heavily on a bevy of skills to succeed. Notable among these will be communication and people skills. Our communities will become hotbeds of climate progress only when the public is sold on both the nature of the problem and the feasibility of the solutions offered. The ability to facilitate that dialogue will be critical. Climbing that mountain will require pervasive public support. The question of initiating effective dialogue with a public that is sometimes skeptical feeds into another question raised in the Kresge report: Whether it is more important to mainstream the concepts of climate adaptation or seek societal transformation with climate adaptation as a driving influence. Mainstreaming refers to the incorporation of climate adaptation concerns and practices into existing institutions and procedures. One major example would be hazard mitigation plans; another would be infusing such ideas into various elements of comprehensive plans, as well as regulatory tools such as zoning ordinances and building codes. Transformation, on the other hand, involves the pursuit of systemic changes in social and political structures. Transformation depends on situational opportunities tempered by foresight and the tenacious pursuit of a longer-term vision, but it does not rule out mainstreaming. Both approaches help to build more resilient communities for the future, but each may miss the mark if seen as the only valid perspective. Because Kresge strives to maintain a social equity focus in climate adaptation discussions, I will point out that the Rev. Dr. Martin Luther King, Jr., was both a visionary and an effective tactician. One must know which matters most at a given moment. The report also mentions the tension between urban and rural perspectives and the potential for smaller communities being left behind in the quest for resources. Here lies a huge opportunity for transformational change, given the recent political divide. God bless the politician who can construct a connecting narrative that brings these forces together behind a progressive, scientifically informed agenda. Gridless communities, generating their own energy locally, are both a catalyst for and an envisioned outcome of transformative change. Source: BlackRockSolar. Figure 27 from Rising to the Challenge, Together. That leads to my final point before simply recommending that anyone with a serious interest in this field download and read the report. 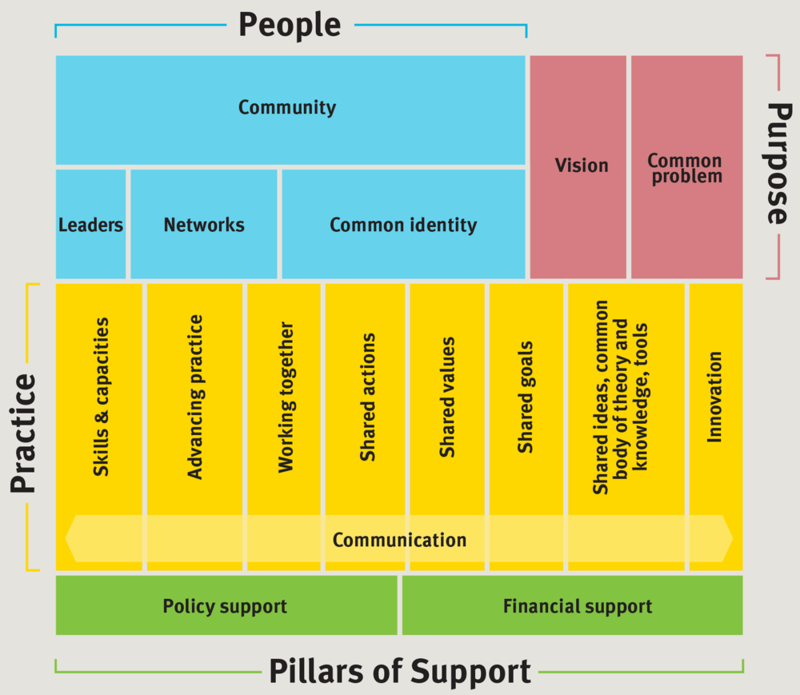 In its final chapter, the report takes note of the pressing need to build relationships across silos, to develop a common language and shared understanding of the problem, and to use a “whole community” approach to address problems. There is much more detail, but this is enough to suggest the drift. Climbing this mountain amid a landslide is no easy task. The details can be grinding and even discouraging when things do not go well. It is important to know how to measure progress and to keep the obstacles in perspective. Planners, particularly, should know this. We are a profession of visionaries who know that details matter. Top image: The People’s Climate March in 2014. Source: People's Climate March. Jim Schwab is an author, speaker, and urban planner. 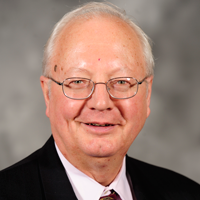 He has been elected the co-chair of APA’s Hazard Mitigation and Disaster Recovery Division, and is the retired manager of APA's Hazards Planning Center.